There is no real victory to be had in Detective 741 (Feb. 00), the final chapter in Endgame, the final storyline in No Man’s Land. But there is a huge creative team, and a large cast of characters as well. Greg Rucka and Devin Grayson are the writers, Damion Scott and Dale Eaglesham the pencillers, while the inks are divided between Sean Parsons, Sal Buscema and Robert Hunter. 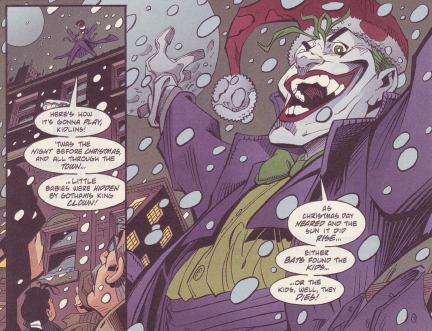 It’s Christmas, and a huge celebration is being planned by Lex Luthor, which the Joker is out to destroy. 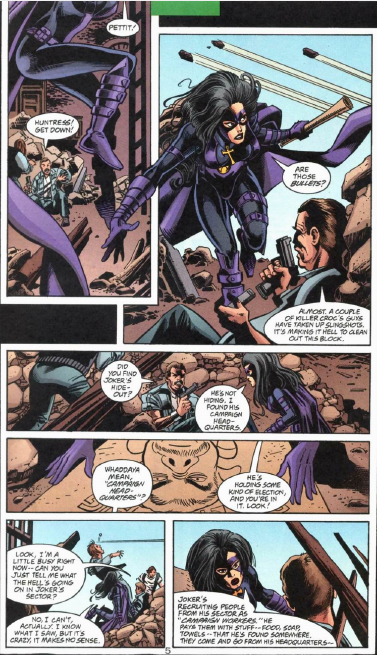 The Huntress barely survives an attack by the maniac at the start of the issue (the conclusion of the previous chapter). 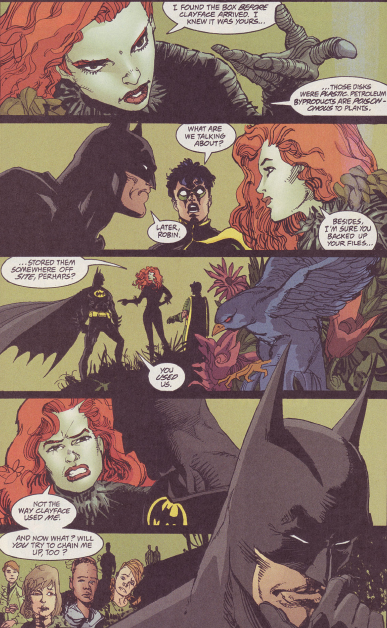 She gets rescued by Nightwing, and even earns a word of praise from Batman. 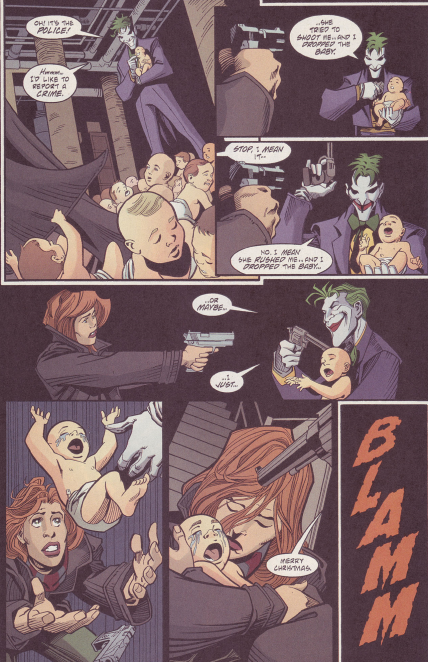 The Joker has had his men steal all the babies – all the children born during No Man’s Land. Batman and crew are not sure what he plans to do with them, but don’t wait to find out. Oracle co-ordinates as people spread out across the city, trying to find the children, but often finding caches of exploding dolls. Azrael and Batgirl (Cassandra Cain now) confront Mercy at Luthor’s huge christmas tree. Mercy tries to get rid of them, but is lucky they were there to spot the dolls on the tree, which explodes real good, though all three survive. Batman has been chasing the Joker, but along the way notices the overtly acrobatic style, and is not at all surprised to discover that it’s Harley Quinn he has been chasing, in disguise. She does give him the Joker’s location, but really, that’s only a sign that it’s too late to stop him, isn’t it? It’s Sarah Essen who confronts him, surrounded by babies, in the basement of the police headquarters. She cannot shoot, and the Joker knows it full well. He has no such qualms, and murders Sarah Essen. He then calmly walks out of the police station, and surrenders. 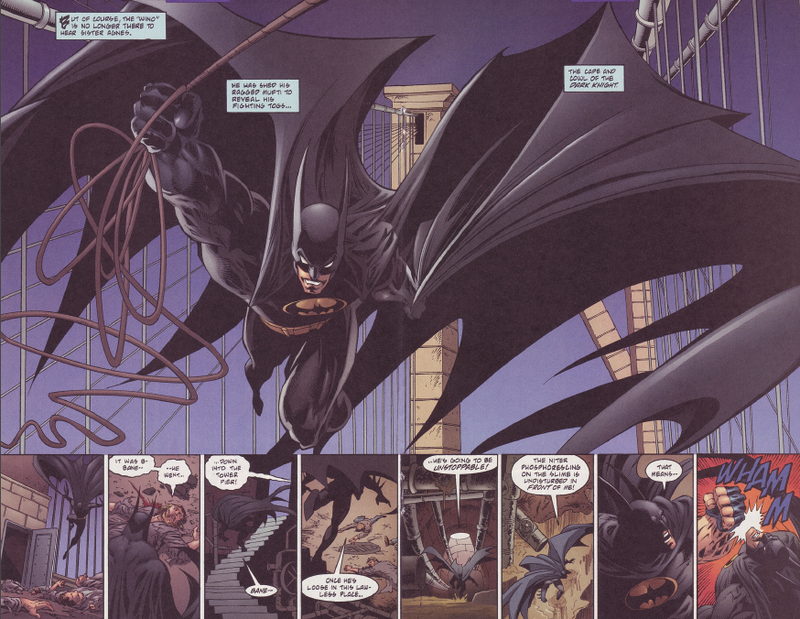 The scene almost dares Gordon to kill him, and Batman makes no move to stop it. 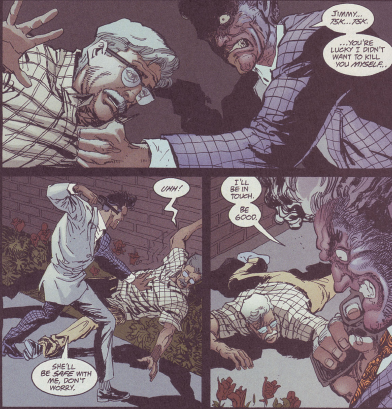 Gordon instead chooses to kneecap him, leaving the Joker lame (though unfortunately that just sort of gets forgotten). A horrible, but perfect, note to end the storyline on. And to give them credit, there really was never another attempt to recreate No Man’s Land, or hasn’t been to date. It would be almost impossible. The current series Batman Eternal is driving huge changes in the Batman world, but doing it in an entirely different way. 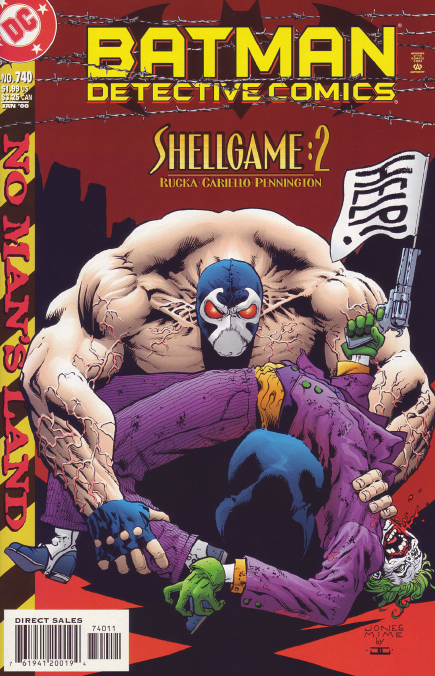 Greg Rucka, Sergio Cariello and Mark Buckingham bring the two-part Shellgame storyline to a close in Detective 740 (Jan. 00), as No Man’s Land draws to a close. The issue, which scans over a large group of people and places, begins with Oracle musing over Lex Luthor’s reconstruction of Gotham, and how he has played the media to make himself the golden boy hero of the city. Batman and Robin have been monitoring Pettit and the Huntress. Their region has held off everyone, including all aid, and the people are starting to flee. Pettit demands that no one be allowed to leave, as it will weaken them. The Huntress tries to reason with him, but fails. Luthor gets frustrated at how his equipment and crews keep getting sabotaged and killed by the Joker, and enlists Bane to guard them. 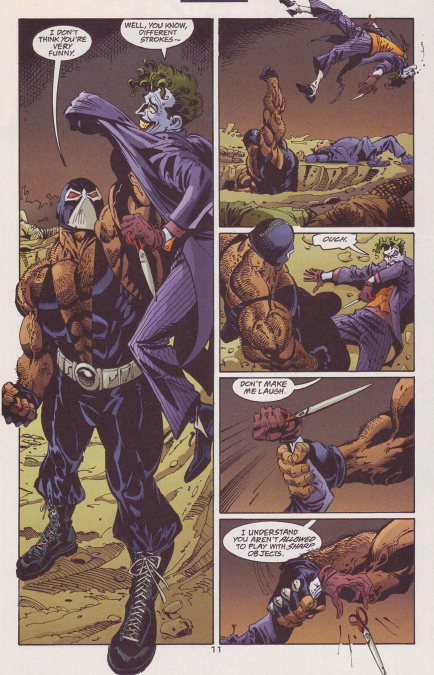 The Joker brings Harley Quinn to help him, but Bane also has Mercy at his side, and fends the Joker off. We even catch up with good old Dr. Simpson Flanders, back on tv, hawking his new book about life in No Man’s Land. With Luthor’s rebuilding indicating a power shift in Gotham, the Penguin makes his move, with a large group of men, to demand his cut of the action. Mercy takes out the Penguin’s men without even breaking a sweat. Luthor gives the Penguin nothing but his own life. 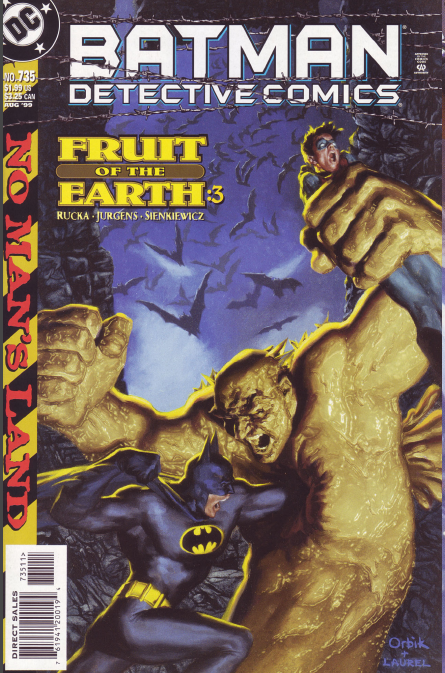 The issue has lots of ominous foreboding, but ends on a happy note, as Lucius Fox takes the airwaves to announce that the government has rescinded the No Man’s Land proclamation, and Gotham is open again. Two-Face is at the heart of this 2-parter, by Greg Rucka, Damion Scott and John Floyd. 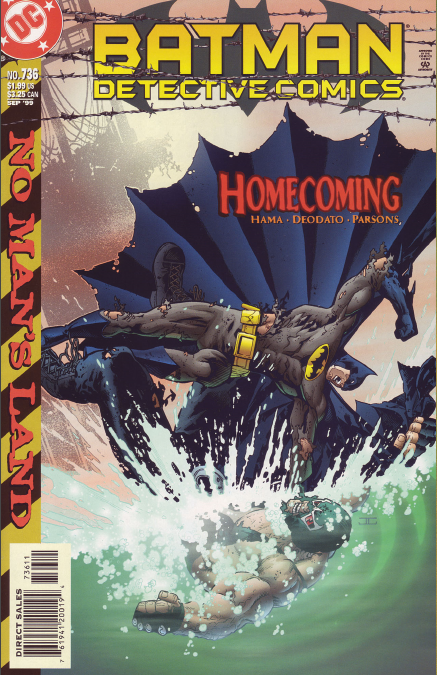 Detective 739 (Dec. 99) rounds out the publishing year as No Man’s Land nears its finale. This issue consists almost entirely of the trial that Two-Face puts Jim Gordon on. 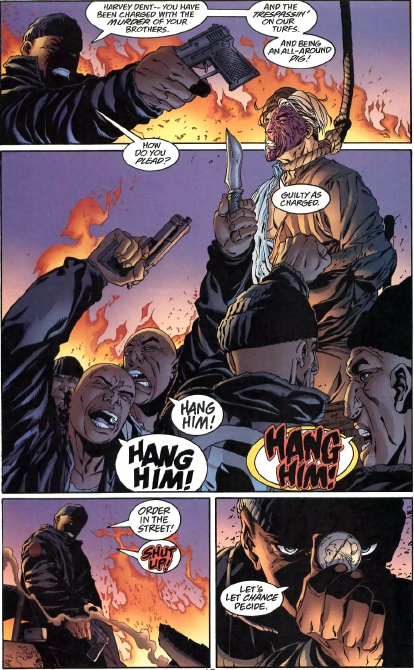 He accuses Jim of making a deal with Two-Face, and then reneging on it when Two-Face called on him for help. 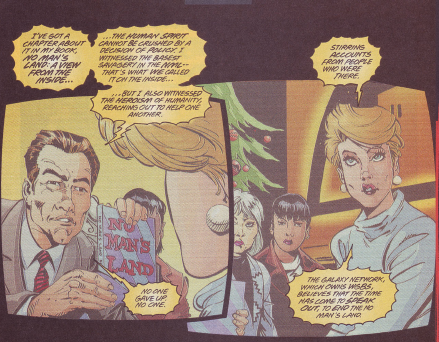 Speaking of Two-Face throughout as if he were a different person, Harvey Dent goes on to show that, due to Gordon’s actions, Renee Montoya and her family were held captive for 5 months. Renee herself is forced to testify. It’s an insane, but masterful prosecution, and Gordon looks despondent. Renee then forces Harvey to act as Gordon’s defense. 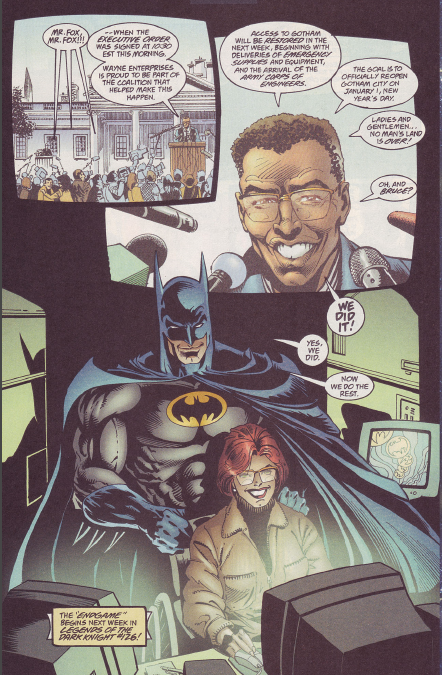 Part of the deal he made with Renee to get her to be part of the trial was to promise to turn himself in if Gordon was acquitted, so Harvey is fighting for his life, against himself. 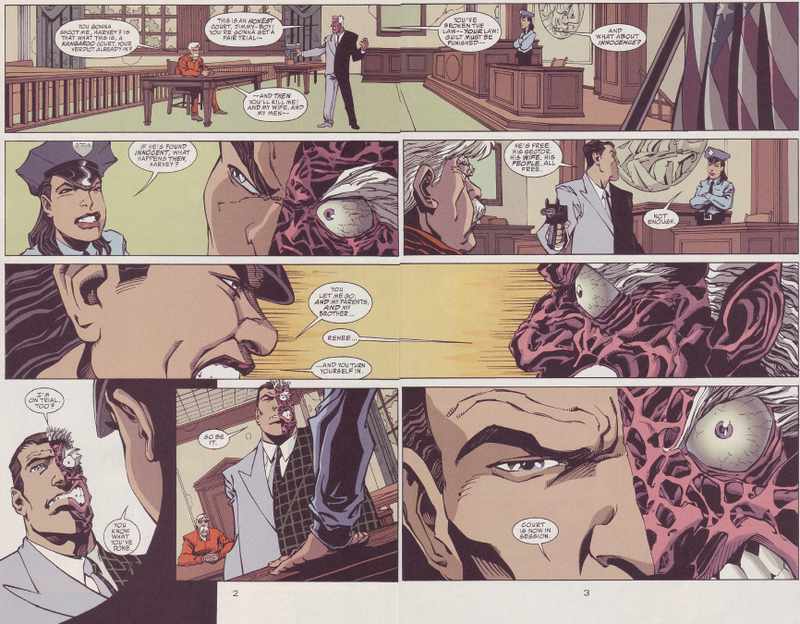 His inner sense of justice prevails, and Two-Face declares Jim Gordon innocent, and allows Renee to take him to jail. Nevertheless, the bond created between these two would play out big time in this book, over the next couple of years. 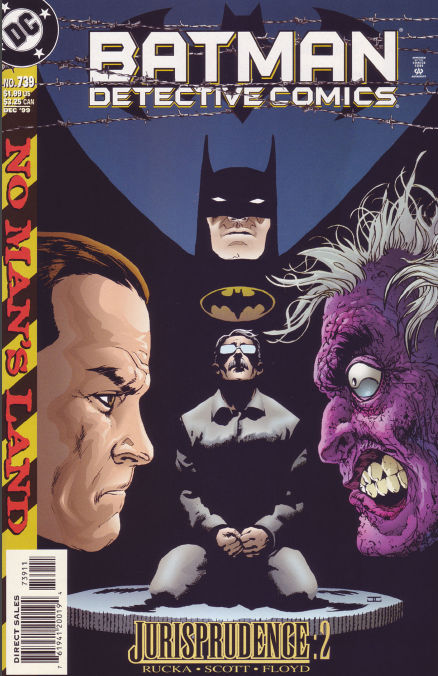 No Man’s Land moves towards its conclusion with Detective 738 (Nov. 99), in a story by Chuck Dixon, with art by Mat Broome and Sean Parsons. It’s the conclusion of a two-part story. Are you surprised it’s a concluding half? By now, you should be used to it. Bane penetrates into the heart of the city – the hall of records. He sets off a (very) low-grade nuke, which destroys the building and renders the land it is on impossible to build on. 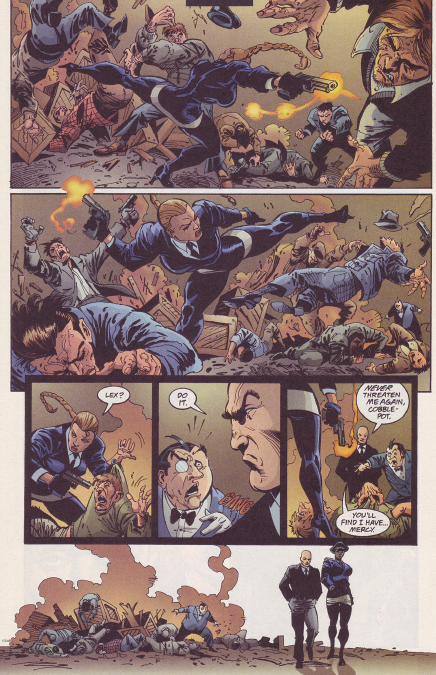 Two-Face also finds himself in trouble, with the Penguin’s men leading an assault against him. Batman and Robin watch both situations unfold. Robin wonders why Batman does not act to stop Bane. Batman is more interested in who might be giving Bane the orders to destroy the Hall of Records. 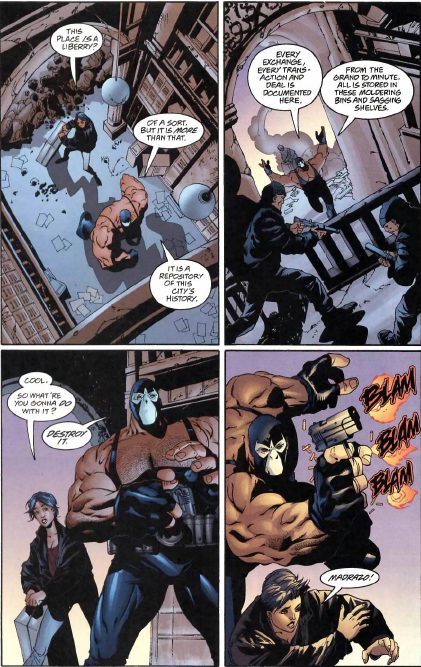 They leave Bane to his bomb, and save Two-Face. 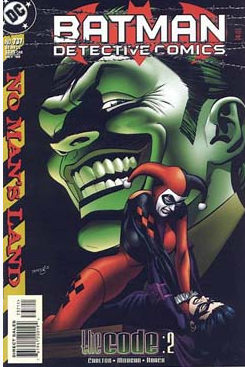 No Man’s Land saw the introduction of Harley Quinn into the Batman universe proper. 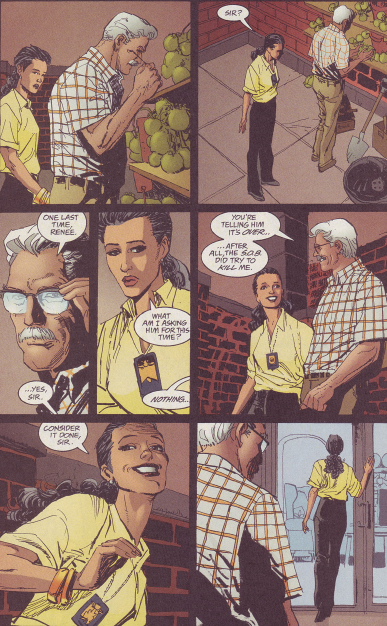 Detective 737 (Oct. 99) concludes her introductory storyline, by Bronwyn Taggart, Tom Morgan and David Roach. 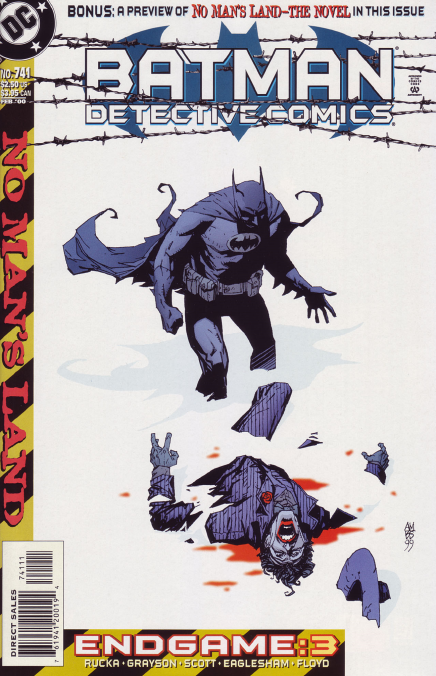 Notice how many No Man’s Land storylines conclude in Detective? 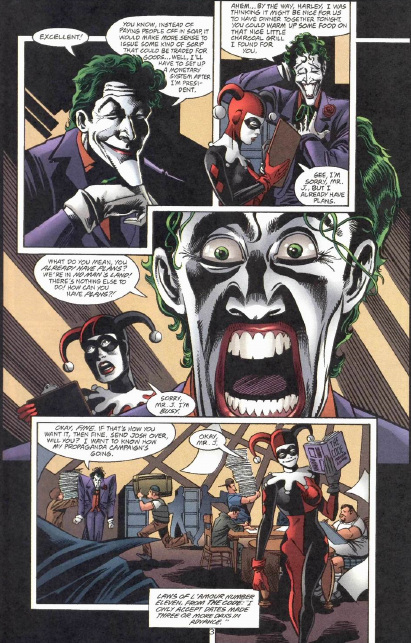 As the Joker proceeds with plans to run in an election in No Man’s Land, Harley Quinn continues to play hard to get. This is part of her “code”on how to win back his affections, after he loved her and then tried to kill her. 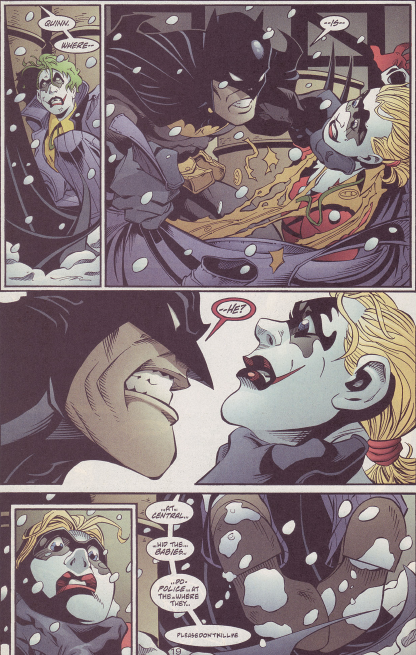 The whole “tried to kill her” thing is not a major issue to Harley. 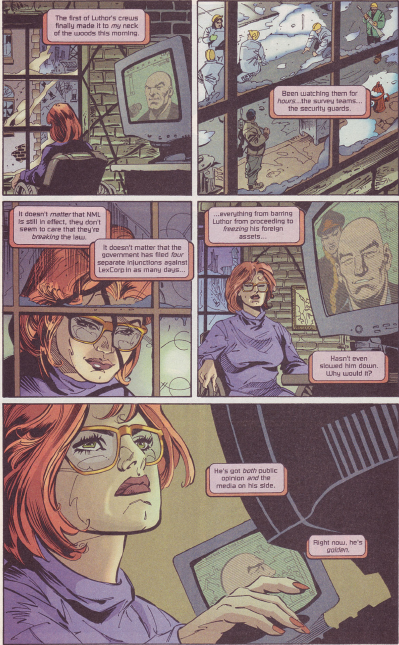 Huntress, now aligned with Pettit, after both were ousted by their respective leaders, reports back to him on the Joker’s election plans. Pettit has more or less taken command of the region abutting the Joker. Josh, the cartoonist who has been making the Joker’s election posters, finally acts on the blatant crush he has on Harley. He simply cannot figure out why she would be more interested in the Joker than in him. 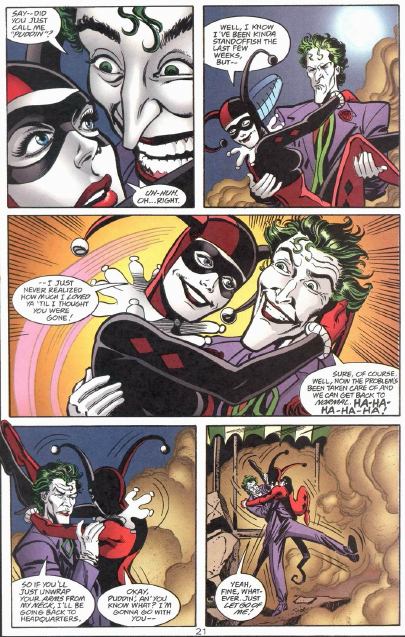 She rebuffs him, but not before the Joker sees them together. 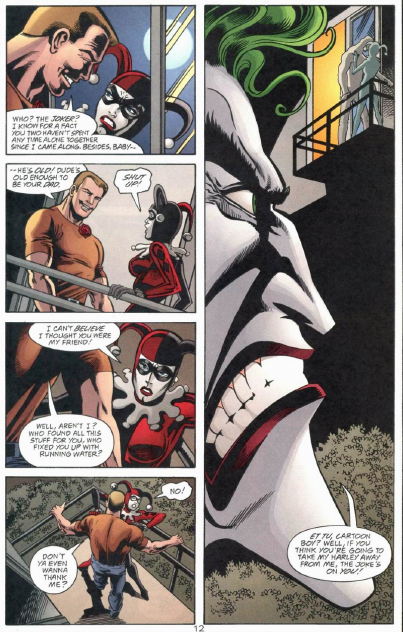 The Huntress has her first confrontation with Harley, as she attempts to infiltrate the Joker’s campaign headquarters. I really like the touch that Harley figures out that the Huntress is a schoolteacher, picking up on her use of words, after only a few sentences. It shows that there is a mind in there capable of achieving her degree. And fighting-wise, the Huntress also finds herself outmatched. 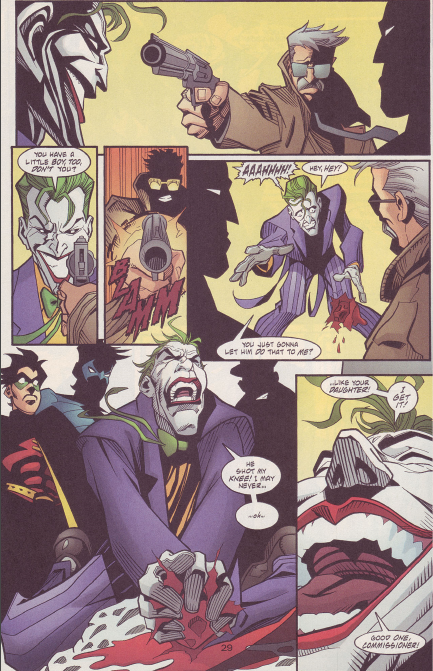 Jealous, the Joker kills Josh in an explosion, which brings Harley running (to the Huntress’ relief). The Joker and Harley re-unite. But now that he has her, the Joker no longer wants her. And on and on and on with these two. 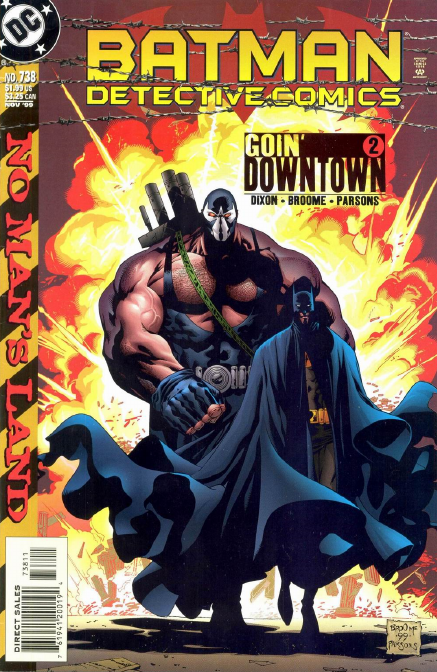 Larry Hama, Mike Deodato, Jr and Sean Parsons bring Bane back to Gotham in the No Man’s Land story in Detective 736 (Sept. 99). It’s a pretty ballsy entrance, befitting of Bane. He rams a car carrier trailer into the barricade on the bridge, and then uses it as a ramp for a second truck, which leaps over the broken part, landing in Gotham. There is a surprising cameo in the story, by Sister Agnes. Batman makes reference to their previous meeting, in the Joker’s Five-Way Revenge, a classic story from the early 70s. 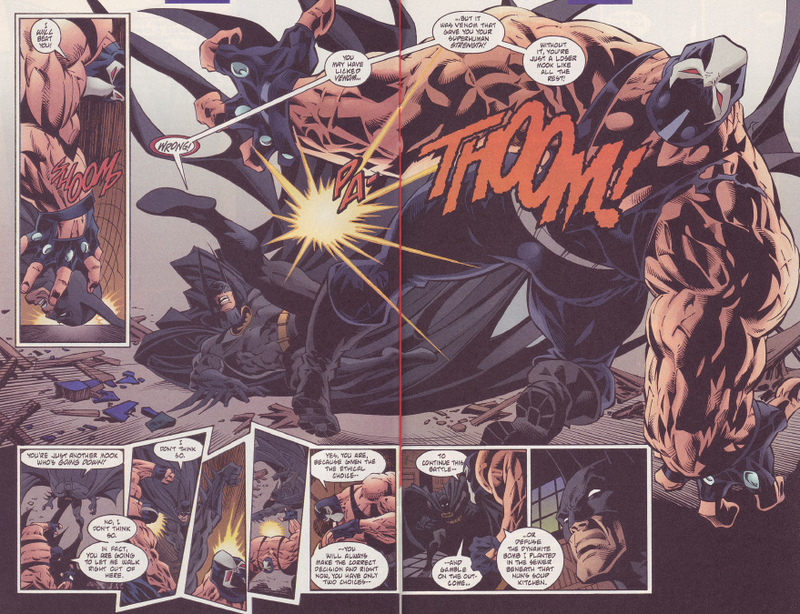 Batman discovers that Bane has returned, and tries to take him down right away, hoping to nip any plans he may have before they can start. Bane has bigger fish to fry than another bout with Batman. 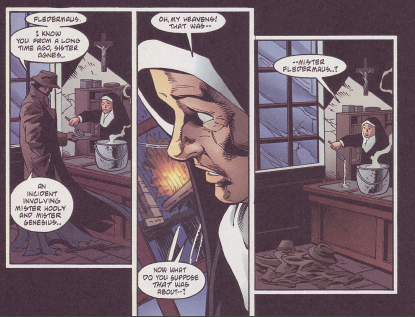 He tells Batman he has planted a bomb in the church of Sister Agnes, and when Batman heads to defuse it, Bane goes off on his merry way. This is one of the weaker No Man’s Land stories. It achieves its goal, but still feels like there could have been more to it. 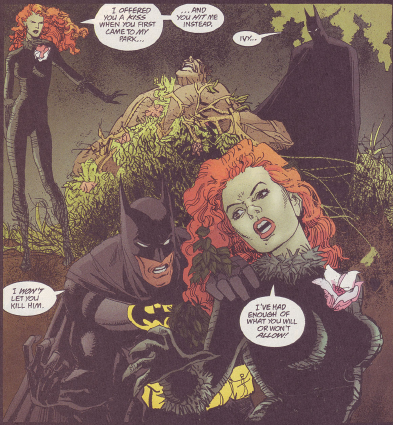 Detective 735 (Aug. 99) sees Greg Rucka, Dan Jurgens and Bill Siekiewicz bring a three-part Poison Ivy/Clayface story to a resolution, part of No Man’s Land. Batman is busy battling Basil Karlo, who emerged from the earth with even greater powers than before. 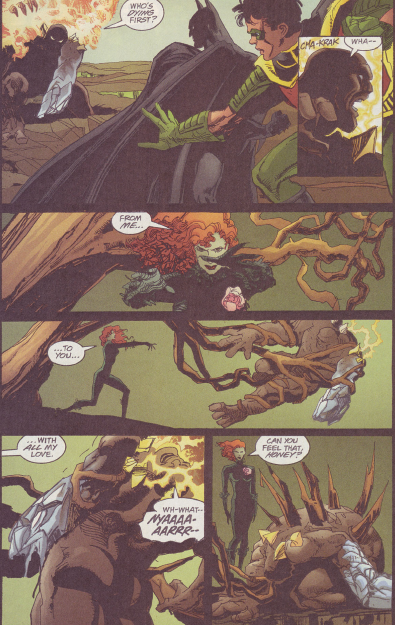 Poison Ivy, trapped by Clayface, was freed at the end of the last part of the story, and takes quick vengeance on Karlo. She uses his body as fertilizer, basically, completely encasing him in plant life. Batman is grateful, largely because she did not kill him. 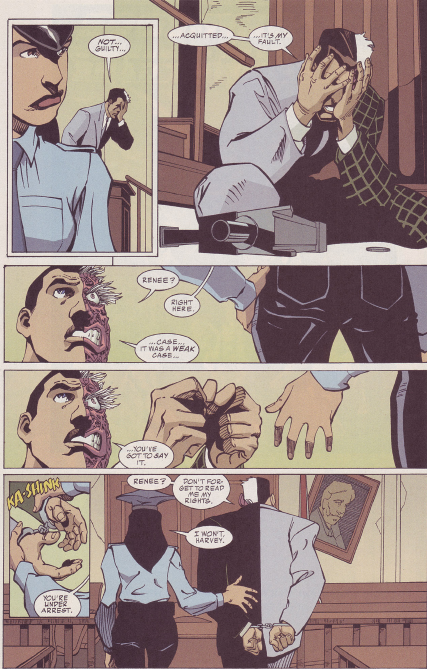 Intercut with this, James Gordon sends Renee Montoya to Two-Face, to inform him that the peace deal between them has ended. 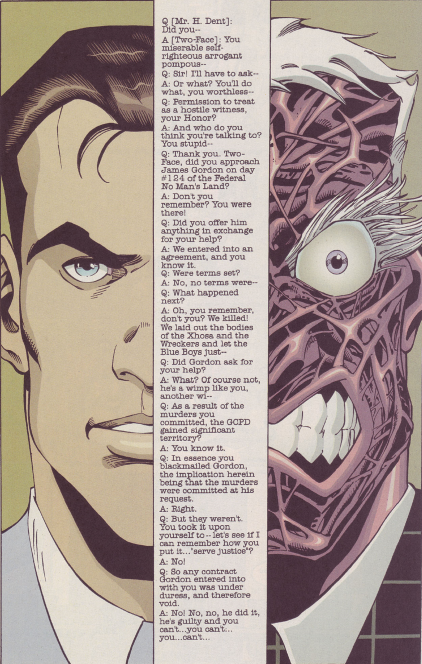 Two-Face’s attempted hit on Gordon nullified the deal, in his eyes. 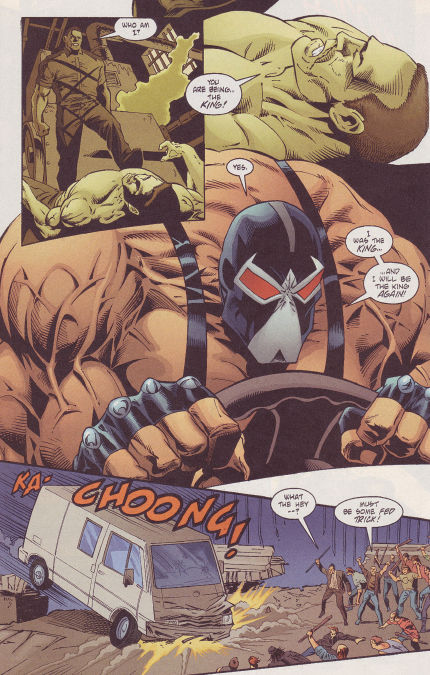 Bane also appears, as a mysterious woman offers him a big payment on behalf of her even more mysterious boss, for Bane to return to Gotham. Two-Face was none too pleased with Gordon calling off their deal. It was a peace pact with Two-Face, how could you expect not to be betrayed? 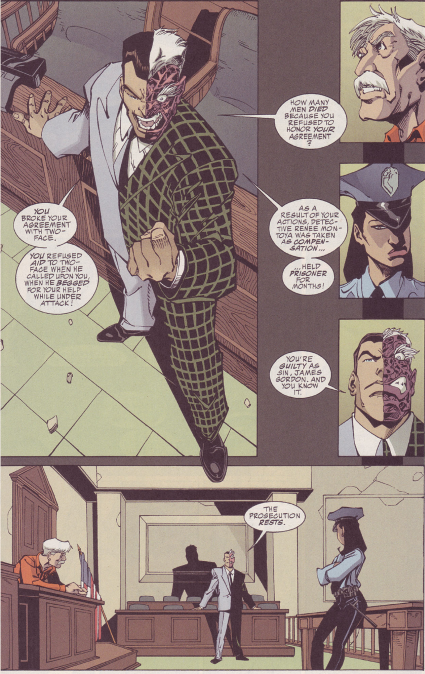 Two-Face is now holding Renee Montoya, and her family, as hostages against any action by Gordon or the police. Back in the park, Batman and Robin discover that the discs they went in to retrieve had been destroyed by Ivy long before. With Ivy sheltering many of Gotham’s abandoned children, Batman has little option but to cede her Robinson Park, as long as the children are kept fed and safe.